Last August, Red Rocks hosted a concert celebrating the 75th birthday of late Grateful Dead frontman Jerry Garcia that featured a set from an all-star band put together for the occasion. Most of the members of what was dubbed the Jerry Garcia Birthday Band will reunite for a pair of shows at Gerald R. Ford Amphitheater in Vail, Colorado on August 17 and 18. Dead & Company bassist Oteil Burbridge, Joe Russo’s Almost Dead & Ghost Light guitarist Tom Hamilton, Widespread Panic drummer Duane Trucks as well as longtime Jerry Garcia Band members keyboardist Melvin Seals and vocalists Jacklyn LaBranch and Gloria Jones will come together as the Jerry Garcia Birthday Band in Vail. 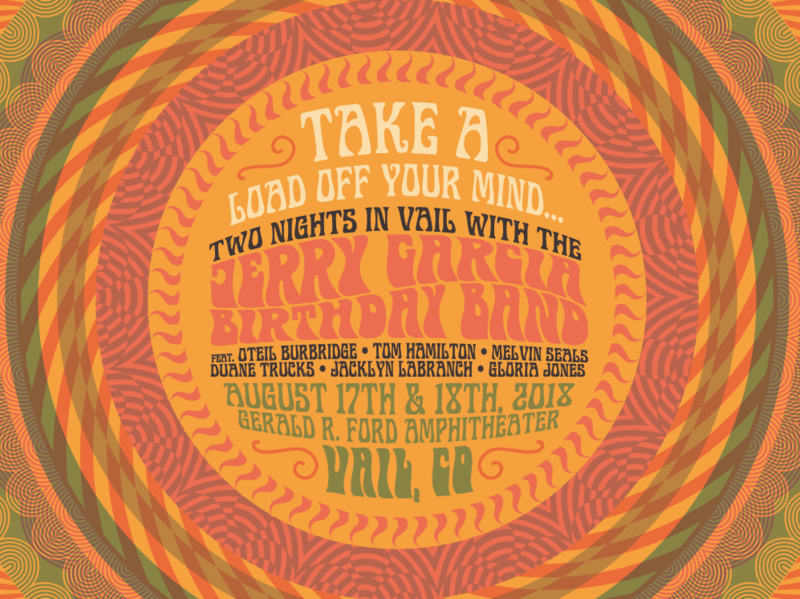 The Jerry Garcia Birthday Band will close out the Vail stages of the Colorado Classic professional cycling event with performances at the Gerald R. Ford Amphitheater on the evenings of Friday, August 17th and Saturday, August 18th. Two-time Grammy winning bassist Oteil Burbridge has been in the music business touring and recording for over three decades. His first step into the national spotlight came in 1991 when he became a founding member of the Aquarium Rescue Unit featuring Col. Bruce Hampton, a cult classic that has stood the test of time. That led to his membership in the classic rock group The Allman Brothers Band. Since 1997, his work with the band has earned him two Grammy nominations for best rock instrumental, in 2003 and in 2004. Over the years, Oteil has shared the stage with rock and blues legends such as Eric Clapton, Carlos Santana, Levon Helm, Taj Mahal, Buddy Guy, Pinetop Perkins, Hubert Sumlin, Billy Gibbons, Chuck Leavell, Bob Weir, Phil Lesh, Johnny Winter, Bonnie Raitt, Sheryl Crow and Trey Anastasio. In 2012, Oteil received a Grammy Lifetime Achievement Award for his 15 year contribution to the Allman Brothers Band as the longest running bassist in the band’s history. He is currently touring with Dead & Company featuring Bob Weir, John Mayer, Mickey Hart & Bill Kreutzmann. Thomas Richard “Tom” Hamilton Jr. (born December 31, 1978, in Philadelphia, Pennsylvania) is an American songwriter, musician, and producer best known as the lead vocalist and guitarist for the bands Brothers Past, American Babies, Joe Russo’s Almost Dead, Bill Kreutzmann’s Billy & the Kids, and Electron. Gloria Jones was an original vocalist in the Jerry Garcia Band.